1. When did you meet each other for the first time? Graham: Calum, Jordan, Dale and I all went to school together. Sean we collectively met through our love for Skateboarding and Jamie - who was the last to join the band - we met through his old band and the Glasgow music scene. 2. How long have you been together as a band, and where was your first gig? Graham: Jamie joined the band on the 1st of April 2005 and that was when we made the decision to try and tour the world and have a career out of our passion for music. Our first show as Flood of Red was in a local venue in Airdrie not 2 minutes from where we live. 3. You toured with Enter Shikari who have gone along on the DIY route, was it an eye opener to Flood of Red's future and did they influence you in that decision? 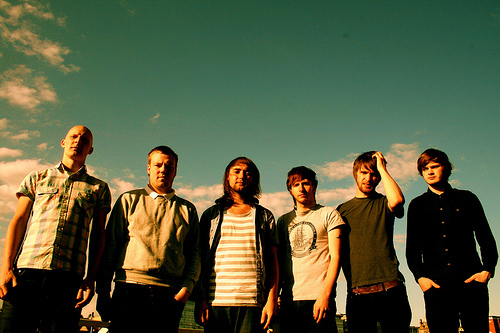 Graham: Touring with Enter Shikari was one of the best and most memorable times in our short career. We always knew that we wanted to have as much control over our careers as we possibly could, we are a very hands-on band and like to be involved with everything we do so our own label was always a part of our long term plan. Seeing our friends make such a great success out of there band and doing it all on their own was a real inspiration to us and it cemented our thoughts on trying the 'DIY' route. 4. Do you get involved directly with organising your gigs or do you have some fabulous helpers who do the hard work for you? Graham: We are involved directly with almost everything we do and from the day we started we managed to book literally hundreds and hundreds of shows ourselves using independent and local promoters all across Europe. The internet and social networking is what we have to thank for that and anyone that is in a band and can connect to the internet have the tools available to them to do what they want and make a success of their band. These days we do have some truly fabulous helpers who work alongside us and have the same love and passion for our band as we do. It is so humbling for us and we could never put into words how much we appreciate their help!! 5. Bands are famous for their touring antics, what has been your worst show or tour to date, and what has been your most memorable show? Graham: We have had some very interesting shows and tours in our 4 years of touring. One tour which was just not meant to be was in 2007 - we were supposed to be doing 10-15 shows all across the UK. A couple days before the tour my car radiator blew up on my arm and I received severe scalding to my left arm and I wasn't sure if I was even going to be able to play the drums but I was going to give it a go anyway. We jumped in our Ex-Police riot van and off we set on the long journey from Glasgow to London. We barely made it 50 miles from our hometown when the van gave up on us. Stranded with very little money we managed to get a local garage to tow our van to their garage where we got the news we were going to need a new part which we would have to wait till the next day for so the 6 of us slept in the van in the garage, woke up early, the van got the new part fitted (the money to pay for which was put up by a good friend of ours) then we eventually jumped back in the van determined to make the next show. 10 minutes later we broke down again and had to return home and cancel the tour. In hindsight it was a lucky break that we had to cancel the tour because with my arm in the condition it was in I would not be able to play the shows and if we had, things could have been very different. A venue we love to play is a small venue in Glasgow called King Tuts Wah Wah Hut which has an awesome pedigree of great bands gracing the stage. We grew up going to gigs there, watching our favourite bands and when the time finally came for us to play and headline there we were all amazed that it sold out and has done every time we've played it since. There is always a great vibe at shows in King Tuts especially with our families and friends there alongside the local crowd who all get really into it. 6. Who writes or contributes to the band’s material, and how were the songs written, did you do it as you went along, or did you all sit together and write the songs in one session? Graham: We all have input into the writing of the songs. Calum our guitarist comes up with the chord structure and some of the main melodies then brings it to the studio where we jam it out and I write the drums and we all work on the tempo/setting/arrangement and what sort of vibe we feel the song should have. As it takes shape Jordan has his notepad full of lyrics with him everywhere he goes and he comes up with his melodies and vocal lines and then we usually jam it out all together and see where it goes. Sometimes it takes a couple hours sometimes it can take weeks, it just depends on the song and how inspired we are at the time. 7. You went overseas to record your album with Brian McTernan, how important was that choice, and how long did it take you to record your album? Graham: We were in Baltimore for a month in Brian’s Salad Days Studio. Brian was always our first choice for recording. When we were younger and we had those 'Imagine if..." conversations, Brian’s name was always the first to come up. Collectively I think we own his entire back catalogue and when he said he was interested in recording our debut it was a dream come true. I think he captured exactly what we wanted and made it better than we ever thought it could have been. It would not have been the same record if we didn't work with Brian. 8. You have started your own record label and sell directly to the fans, rather than use the many independents and their distribution channels, is that a gamble for the band, and what about overseas distribution? Graham: I guess you could say it is a gamble but it is something we are confident in and we believe we need to do. We want to give fans the best we can for the best value. We are trying to cut out the middle man who add on their percentage and astronomically raise the price to line their own pockets which ends up costing the fans through the teeth - just for a CD. We also don't have record label executives telling us what to do. We have full creative control over our careers and control over everything else we do. We don't have to rely on someone else who may not have as much passion or put in the same effort that we will do for ourselves. Because we own the copyright for everything ourselves we can choose how we do things overseas. For example if we find a label we like and we think will do a good job we can work alongside them and they can assist in their own territory and give us their experience and knowledge of their country and the music fans of that area which we don't have. We will always have our material available from our website and we will always find a way to get our merchandise, music and even shows to where ever we can. 9. Your myspace page is well viewed with upwards of nearly 2 million plays, which is a lot for a UK band that has not yet released their first album. That reflects your hard work and all the shows you have done, can you remember how many gigs you have done in total and do you have fans from overseas? 10. Obviously you will want to cement your success in the UK, but do you have plans for any major overseas tours, or festivals? Graham: As I said above it is our goal to play everywhere and any form of show, be it a house party a major festival… we will do our best. If you are interested, keep checking our website (Offer | Flood of Red) and we will be adding shows in new places all the time. We are looking at getting ourselves over to the States early next year as well as Japan and Australia. Europe we will hopefully be making a couple trips over before '09 is out. 11. You all grew up in Scotland, but I understand that you’re not all Scottish, has that helped to shape your musical style with different influences coming in, or are you all on the same wave length? Graham: Calum was born in Sonoma California, Jamie was born in Johannesburg in South Africa and Dale was born in Halifax in Canada. The rest of us were all born in Scotland. We have all lived the majority of our lives in central Scotland and our music tastes all vary for different reasons but when we come together we each bring something different to the table. 12. The album title Leaving Everything Behind - does that have any special meaning for the band? Your Bio says that the songs were written about growing up in small towns in Scotland. Although you will always be influenced by that, do you write from new experiences and could we see something different in the future? There are a few reasons we decided to name it "Leaving Everything Behind". For us, when we committed to the band full time we were 'Leaving Everything Behind'. We chose not to stay on at school or to go to University or College but to enter the unknown and try to make a success of the band. As you mentioned we are also trying to break free of the small town mentality that so many people in our area have grown up with which is embedded in their minds. We would rather leave everything behind than be trapped in the one place for the rest of our lives. That feeling of trying to escape will always have a strong influence on us! There are also a few quotes from the record which have a similar vibe to the title. The lyrics are all written about honest and true situations, everyday life and things that your average person can relate too. Who knows what will happen in the future but honesty is a big part of the band and we will always stick to that. The Flood of Red single 'Home Run (1997)' was released on 5th October here is the great video for the song... and our our review and what we said about it..